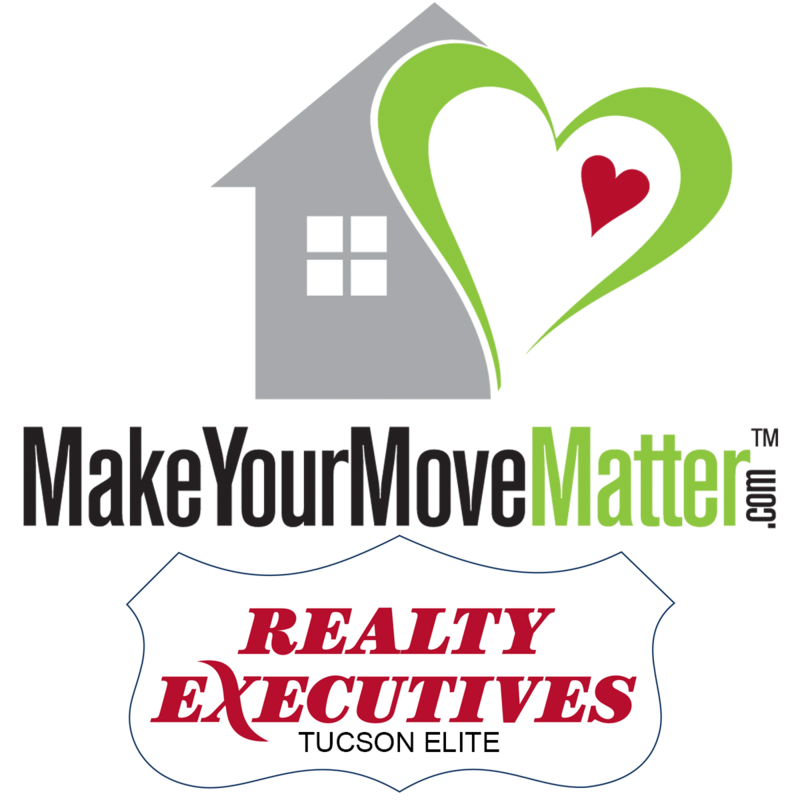 The Make Your Move Matter team recently welcomed Jo Parsons as their SaddleBrooke Real Estate Concierge. 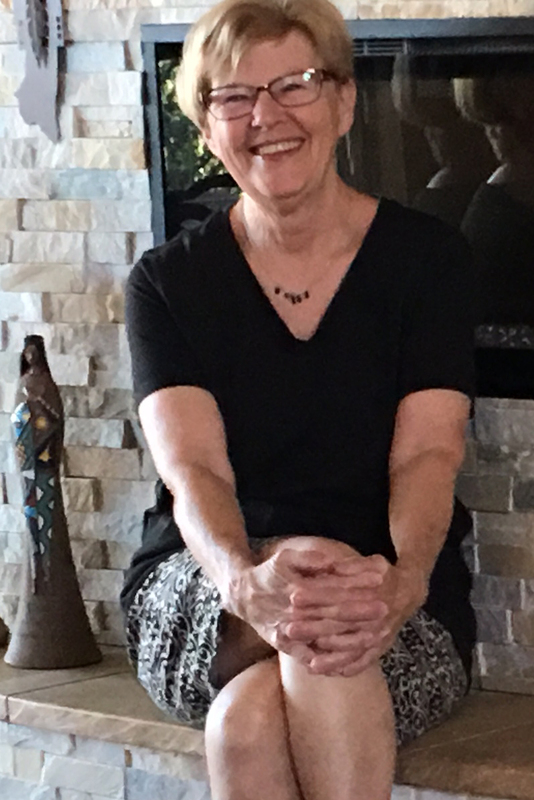 Although she retired her real estate license and is restricted from performing a number of licensee duties, Jo is able to provide invaluable assistance to buyers and sellers working with Realtors Beth Fedor, Lynn Tofel Dent and Sallie Tofel. How would you sum up your role as a Real Estate Concierge? I am doing what I loved best about being a Realtor. For Beth and Lynn’s sellers, I help homeowners ready their homes for market by providing reliable referrals for home repairs or improvements and help stage their house to appeal to the widest variety of potential buyers. For their buyers, I assist with design decisions, whether it be new-build construction or resale renovation. Is it time to move? Have you outgrown your ‘starter home’? Is your job taking you out of town or is your commute just too long? Remember the excitement and emotion in buying your first home? Well, I’m happy to tell you that selling your first home is a lot less about emotion and more about maximizing your profit potential. Here are 6 tips to get you started in the process. 1. Price Your Home Correctly! Do not rely on Zillow or your next door neighbor who dabbles in real estate. Your house is most likely your biggest investment and you want to put your trust in a professional. Hire a Realtor who is experienced and reputable. Your agent will analyze sales in your neighborhood and prepare an estimate of value (often called a CMA or Comparative Market Analysis). Sometimes we will tell you your house is not worth as much as you think it is, which is never an easy conversation. Keep in mind that we have a fiduciary responsibility to you and want to maximize your return on investment! Should you spend the money to pre-inspect your home before putting it on the market? Absolutely! As homeowners we tend to get attached to our homes in their current state and over time it’s common for flaws to blend in. A Buyer is not going to overlook the flaws and defects, nor have the same attitude about ‘living with it’. Sometimes you may not even be aware of an underlying problem! Know the exact condition of your home – Price your home more accurately. 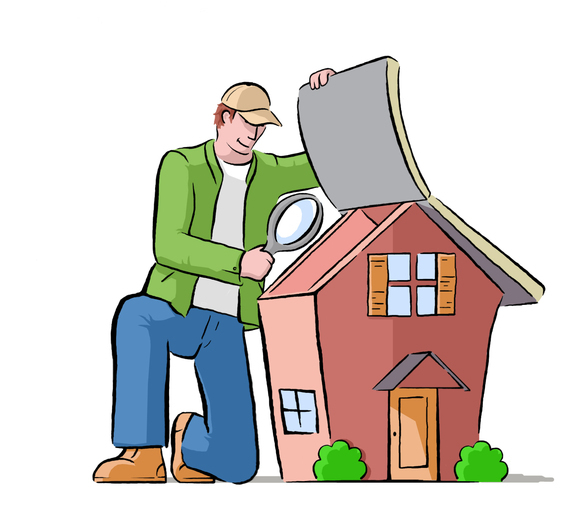 You don’t have to fix everything the inspector finds, but with knowledge you can price your home to sell based on its present condition or make upgrades that will improve its marketability. 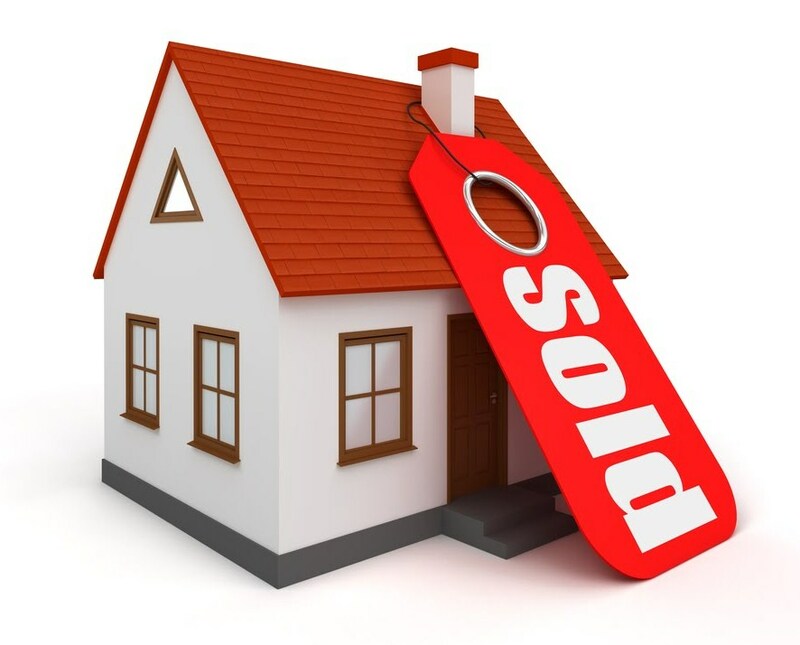 Reassure prospective buyers – Gain the competitive edge A pre-inspection is a goodwill gesture to buyers. It demonstrates a willingness to go beyond the expected and sets you apart from other sellers. When Bill and Linnea Boaz decided to make SaddleBrooke their permanent home after a five year hiatus, they set their sights on finding an open floorplan similar to that of their Oregon home, hoping to replicate its open earthy feel. Transfixed by the mesmerizing backyard view of a resale home which overlooked the SaddleBrooke 9’s #3 Fairway with lake, fountain and mountains behind, the Boazes contemplated something they’d never done before—purchasing an undesirable house that, according to their realtor would require a total gut job to renovate. While its front courtyard and backyard were inviting spaces, the home’s interior was dated with an abundance of columns, wall-to-wall mirrors and five different floor coverings. With a background in finance, the couple knew that they’d be building on the solid investment of a breathtaking premier view, a limited commodity in the nearly built-out community. With the help of Jo Sauvageau of JS Design, the Boazes set about reimagining the floorplan to suit their lifestyle and managed their material selections from afar via computer as they returned to sell their Oregon home. “I told her I’m not into grey, white or black; I prefer warm colors that remind me of the Pacific Northwest,” shared Linnea. With that in mind, Jo was able to find a stone look easy-care porcelain tile which, excluding bedrooms, was laid in an offset horizonal brickwork pattern throughout the house, effectively tying the living spaces together for improved flow. Adding to the congruity and flow are new beefier baseboards and oil-rubbed bronze fixtures and fans. Eschewing the need for a formal dining room, the Boazes had the fussy colonnaded open dining area with ornate brass chandeliers converted into a dedicated office for Bill with a double door entryway. Half columns that flanked the opposing hallway were also removed and the arc of the archway flattened for a more modern aesthetic. With its former carpet flooring removed, the formal living room became part of a larger great room space flowing into the kitchen and adjoining family room, the latter now repurposed as a less formal dining space. The dining room’s new location takes advantage of the gorgeous golf course, lake and panoramic mountain views while overlooking the elegant and efficient new kitchen. While the core kitchen footprint was maintained, cabinetry was removed and a soffit was reconfigured to allow for taller upper cabinets and a Lazy Susan corner cabinet replaced the builder’s space-inefficient blind corner cabinet. The kitchen island was also shifted slightly to allow a more functional work triangle. Knotty alder cabinetry topped with Golden Crystal Granite from Tucson Stoneworks lends a warm ambience with the vibrant movement of iron oxide golden veins swirling through a rich background of tans, creams, golds, chocolate brown, taupe and black. The same striking granite tops a huge new 7’ x 4’ peninsula bar with built-in wine refrigerator and storage rack, enhancing the kitchen’s storage and entertainment functionality. The peninsula along with the family room entertainment wall forms an L-shaped divider featuring a double-sided fireplace refaced with earthy stacked stone and rustic free-form alder mantels on both sides. On the opposite side of the kitchen, new built-in shelving flanks the fireplace, providing storage and display space. In the master bath, the awkward corner-set soaking tub was removed and the toilet, originally housed in the same room as the shower, was repositioned in the original shower space to form its own room, allowing space for a larger luxuriant walk-in shower and extended executive height vanities. Golden Crystal granite is also carried into the master bath with a tower cabinet separating his and hers sinks adorned with rich metal framed mirrors replacing wall-to-wall mirrors and oil rubbed bronze fixtures. “The doors were what everyone seemed to be talking about,” related Bill Boaz at the wrap-up of the March SBCO Renovated Home Tour. From the front door to the interior doors throughout, bland and boring builder hollow-core doors were replaced with handsome knotty alder doors. At the front entry, the oddly unbalanced palladium window was removed to make way for a taller eight foot entry door. In addition to their beautiful form, the door replacements also addressed the poor builder planning by reframing the master bedroom entrance from a double to a single-entry door to eliminate the awkward swing that blocked the bathroom entry and replacing the laundry room door with a pocket door that would not block the dryer when opened. For approximately $150K, the Boazes succeeded in building a nearly new home atop the existing foundation, replacing the roof, HVAC, water heater, flooring, cabinetry and countertops. 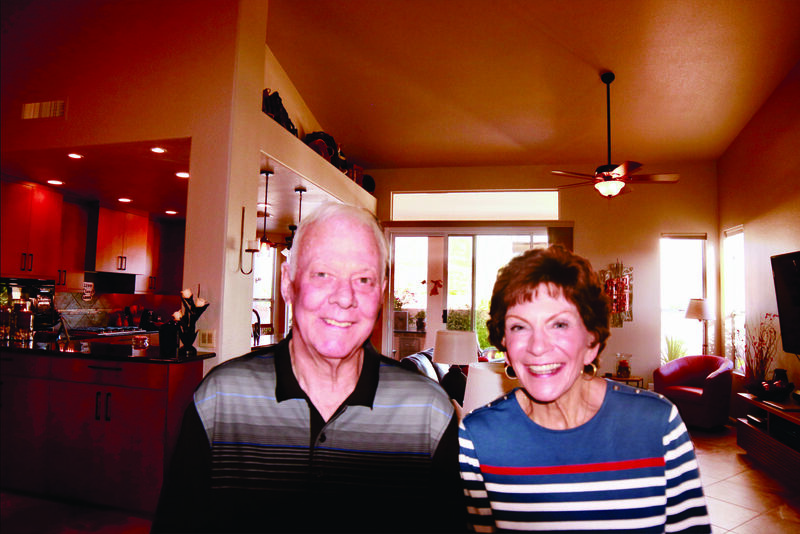 Beyond the cosmetic upgrades, the eco-friendly couple paid heed to some greener aspects of home renovation, investing in solar panels and energy efficient window replacements. Along with adding insulation in areas where it was non-existent and augmenting other areas, the Boazes now enjoy saving, on average, $90/month off their electric bills. 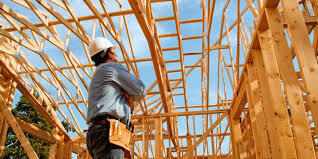 Although, in hindsight, they would have added greater allowances for construction time and expense, the world travelers are content with a property they can leave with little worry, and a beautiful, customized Home Sweet Home awaiting their return. If you put your home on the market today, would it appeal to newly retired “baby” Baby Boomers? Young Baby Boomers are in their fifties and are not only likely to be extremely computer savvy, but there’s a good chance they watch TV remodeling shows, maintain Pinterest boards and visit Houzz.com for decorating tips. Like Gen Xers and Millenials, they desire a house that is move-in ready and updated. Does that mean you have to completely renovate? Absolutely not! But, certainly, you should think about freshening up before you put a for sale sign in the yard. 1. Paint: If your house has the same color palette it did when it was built – it’s time for a change. You may still love it, but we can assure you many buyers won’t be able to see past a dated color. 2. Kitchen: No need to tear out cabinets, sometimes a simple facelift of new doors or a coat of paint will do the trick and we always encourage new countertops. Tip: granite is out and quartz is in! 3. Floors: Wall to wall carpet is a turn-off for young retirees. Think tile in common areas but be careful placing one kind of tile next to a different one. We’ve seen that go badly! There’s a buzz in the air – new homes and developments are coming to the area and you are intrigued. What if you could move? What if there were no more expensive hassles with aging, inefficient A/C units or appliances? With brand new appliances, plumbing, heating, and electric, you could be repair-free for (at least a few!) years. With new construction, you would get to choose your home’s finishes according to your taste and preferences. You could enjoy the most up-to-date design elements and trends and the cost savings of more energy efficient construction. Plus, nothing beats that new house smell! You’re looking at all the options and are almost convinced that new construction is the way to go. Prior to renovating their SaddleBrooke home, Dave and EddyLee Scott had extensively remodeled two former homes and redesigned a new-build condominium, along with designing yacht interiors during their career as brokers for American Tugs in Anacortes, Washington. With a lifetime of remodeling experience, the Scotts’ top priority for a new home was a lot with views—the rest were just details to be figured out. Accompanied by their realtor and contractor, the Scotts opened the door for a first look at a 1995-built Fiesta floorplan with original wall-to-wall carpet, oak cabinetry, prefab shower surrounds and cultured marble vanities. They remained undaunted. Dave credits his wife and contractor, Greg Smith (owner of SaddleBrooke Remodeling), with the results, “EddyLee has a history of being able to see past a home’s present state and imagine its possibility and Greg’s been around these SaddleBrooke homes for a long time and knows every model so well.” With a roll of blue tape in hand and a nod from Greg on feasibility, EddyLee proceeded to mark off view-blocking walls. After purchasing the home, the Scotts returned to Washington and Smith and his crew began Stage 1 of a two-stage remodeling plan, the refresh of the home and reveal of its view. An open concept floorplan was achieved by removing both the living and dining room pony walls, along with an entire wall with arched openings that separated the family room from the living area. The house was repainted, and the existing patchwork of tile and carpet was replaced with a continuous span of large ceramic tiles installed on the diagonal to visually widen the space. A new contemporary gas fireplace boosts the room’s ambiance. The resulting great room space affords beautiful mountain views from the front door and a space that flows seamlessly, enhancing entertaining. 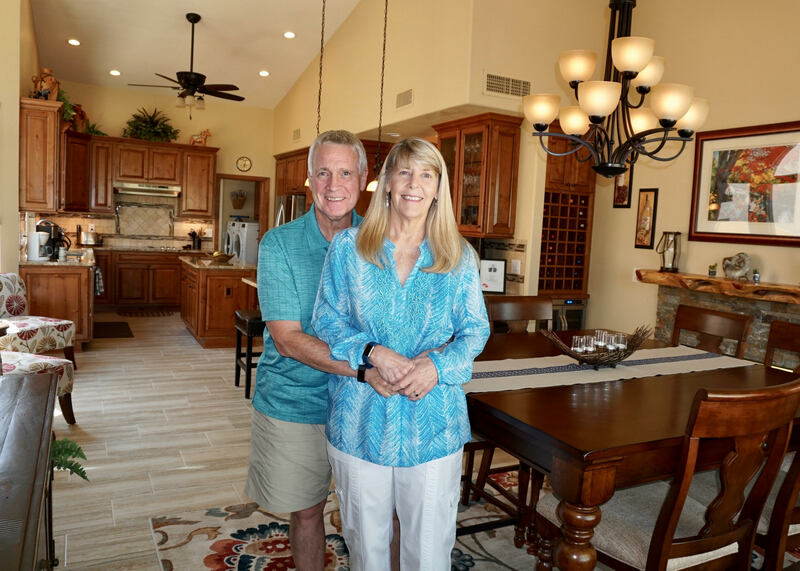 Returning from a six-month absence, the Scotts were thrilled with the results and eagerly proceeded to Stage 2: the remodel of the kitchen and master bath, and addition of a detached casita and outdoor kitchen. The removal a of large portion of the wall closing off the kitchen from the dining room and tear-out of the overhead cabinetry, dubbed “head-knockers” by Dave, set the stage for the kitchen remodel. The kitchen was completely gutted and its function enhanced with the elongation and extension of the sink counter to create a raised eating bar. Sleek wavy-grained cherry cabinetry extending to full ceiling height reflects the Scotts’ boatbuilding background. Contemporary black hardware compliments the dark granite tops and black appliances. The chef’s space extends outside to a new outdoor kitchen complete with a stainless steel three-burner grill and a built-in cubby to house a Big Green Egg. 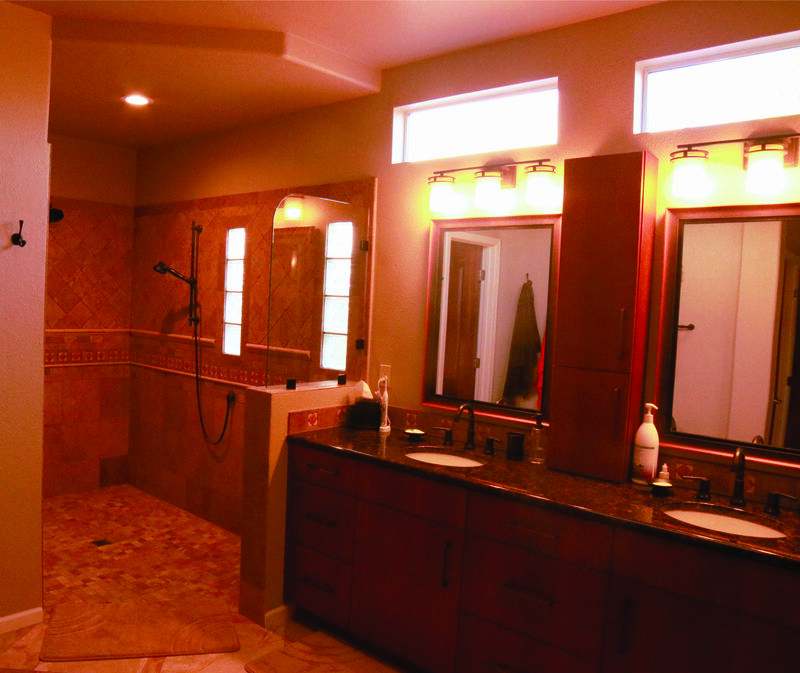 In the master bathroom, the cumbersome tub was removed, providing space for a new large doorless walk-in shower. An extended vanity with a tower storage cabinet divides his and hers sinks. In addition to the main house, the Scotts began EddyLee’s favorite improvement: the construction of a casita. Built at the front of the house and positioned to flank the garage, it allowed for the creation of a charming gated flagstone front-courtyard built to accommodate an existing mesquite shade tree. Complete with a kitchenette/coffee bar and bath with walk-in shower, the 270 square foot casita provides a private, cozy respite where guests may appreciate the views that first captivated their hosts. All in all, the Scotts estimate they spent $150,000 on their remodel with approximately one-third toward the casita build. To show their appreciation to contractors and crews, the Scotts paired with friends Bill and Janie Fowler (also SaddleBrooke Remodeling clients) to host a progressive dinner party at both homes, inviting all the subcontractors, vendors, workers and their spouses and families. “They were all so good and went the extra mile!,” enthused EddyLee of the desire for a community celebration. Presenting one of seven homes featured in the 2018 SaddleBrooke Community Outreach SBCO Remodeled Home Tour held Sunday, March 11 to help fund SBCO’s programs that greatly benefit youngsters in nearby communities. If you are interested in participating in next year’s Remodeled Home Tour as either a homeowner or a volunteer, please email Trish Parker at patti.parker@gmail.com. 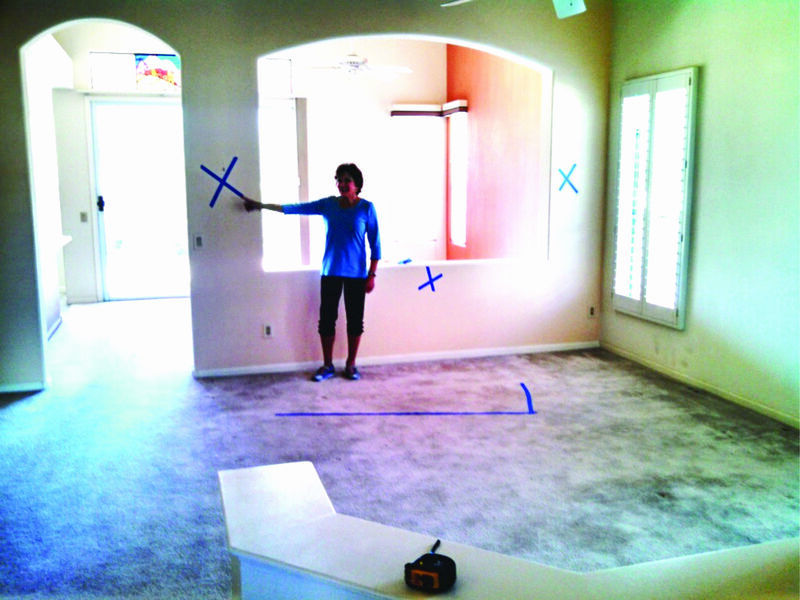 Over her ten year real estate career, Jo Parsons assisted innumerable clients with her knack for reenvisioning floorplans. A recent downsizing move from a Dakota to a Portofino Villa became Jo’s most recent challenge: to make 1568 square feet perform and feel much larger. Tour attendees were amazed by the resulting expansive feel of the Parsons’ villa renovation. 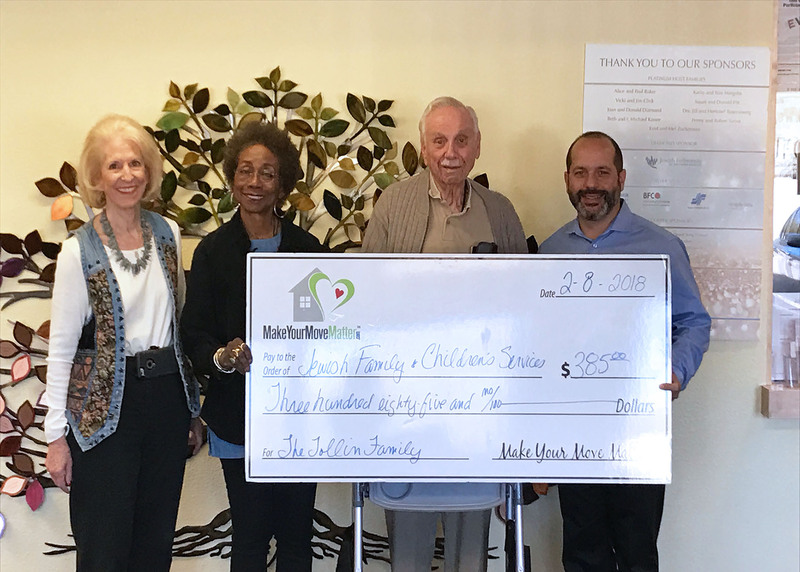 We are proud to be able to donate to the Jewish Family and Children's Services here in Tucson. 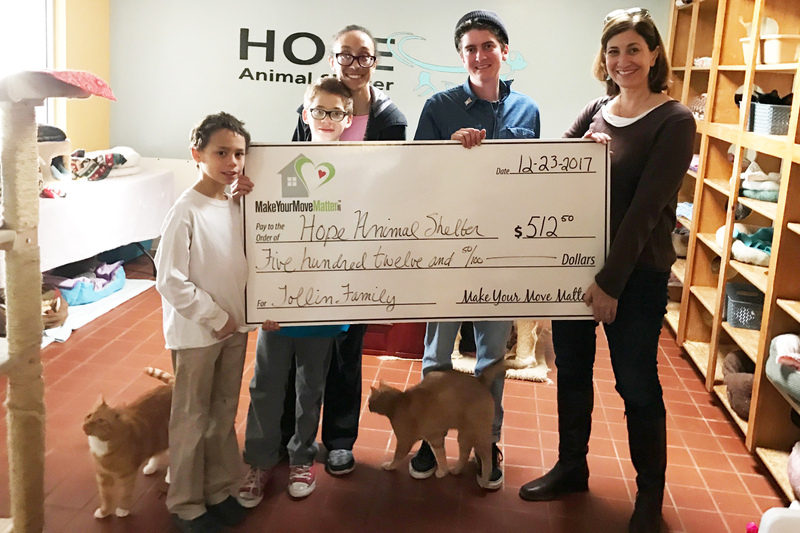 Thank you to the Tollin family for choosing this worthy cause! JFCS of Southern Arizona provides emergency and counseling services to families in need and a multitude of Social Services to the community. The Tollin boys love animals, so choosing to support the Hope Animal Shelter was an easy pick! This picture was taken in the 'Cat Room' where dozens of cats wait in comfortable freedom for their forever family to find them. The $512 donation from the sale of their home will go to support this worthy cause.